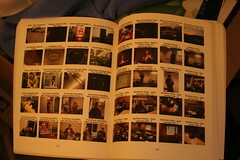 My 565 page, 11300 photo Qoop Flickr book rocks! As a nice gesture of thanks for helping debug their stuff with a large data set, the Qoop folks sent me a 565 page book with all of my public flickr photos (20 photos/page * 565 photos = approximately 11,000 photos!). Most excellent and again like the 13x19 Qoop poster, highly recommended. It's like a photo Wunderkammer or book of brilliant things. I'm having a great time leafing through and picking out random pages. The 11,000 photos span the period February 2004 to early September 2005 which has definitely been a life changing time for me and the photos show. From my Canon S100 in 2004 to the Canon S400 and Nokia 7610 and Canon 20D today the photos have changed because the tools I use to take them have changed. But the basic premise is still there. They are a great record of my life and how it has changed over the last year and a half. I'd love to have one of these books for every year of my life. Hmmm wonder if I can afford it. Better ask the Qoop folks how much this would cost!